Be sure to look at our Online Auctions. 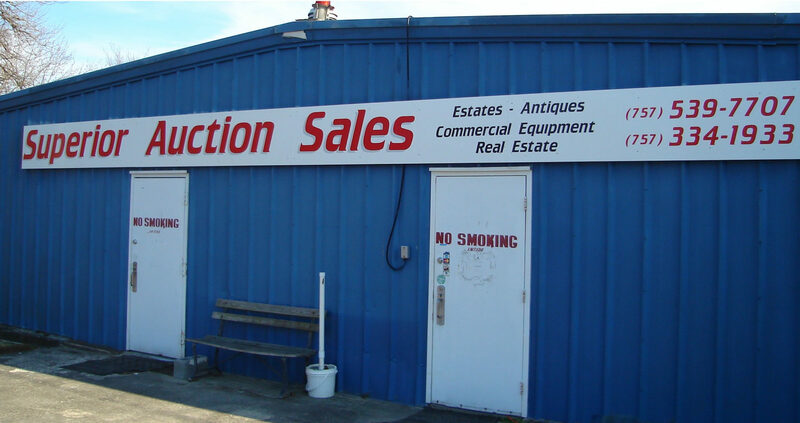 AUCTION EVERY TUESDAY 6:30 P.M.
Sell Real Estate at Auction!! We are fully mobile and can conduct auctions on location or in our auction facility! We are now accepting consignments for the next sale If you have one item, an estate, farm equipment, or commercial inventory to liquidate, please feel free to contact us for consultation. You may call me any time at (757) 334-1933. Give us a call today. Consultations are always FREE! In addition to the following local auctions, we also have Online Auctions. 3) All items must be paid for Sale Day, and must be paid for before removal. 4)All items sold “AS IS”. 5)Auction company is not responsible for accidents on or off auction site. CASH OR GOOD CHECK Visa/MC. 13% BUYERS PREMIUM. 5% SALES TAX. ALL ITEMS MUST BE PAID FOR THE DAY OF SALE. Same day removal. SUPERIOR AUCTION SALES IS NOT RESPONSIBLE FOR ACCIDENTS. SALE DAY ANNOUNCEMENTS TAKE PRECEDENCE OVER ADVERTISEMENTS. ITEMS MAY BE ADDED AND REMOVED AT AUCTIONEER’S DISCRETION. ALL ITEMS SOLD AS IS. ARRIVE EARLY TO INSPECT ITEMS OF INTEREST. Please give us a call now to arrange the consignment of quality items you would like to liquidate! We have full ability to safely pick up, inventory and store your assets for upcoming auctions, WHERE EVER YOU MAY BE. It doesn’t get any easier! Need to sell immediately? No worry! We also buy assets of all types. We are especially looking for oak, walnut, and mahogany furniture. We’ll get you a list out immediately. From West: Take 58 East, Take Wilroy Road Exit, Take a Left onto Wilroy Road, Take a Right at the stop light onto Progress Rd, Go to the end and take a Right onto Nansmond Parkway, Go Straight through the stop light and cross Rail Road Tracks, Auction House on Left in Big Blue Building. If you need further directions please do not hesitate to call!